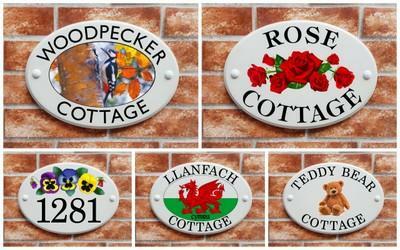 Custom made House Signs offered in many shapes, colours & sizes. 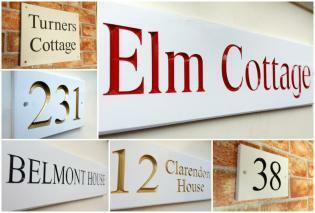 Experienced since 1995 we manufacture thousands of bespoke signage products for properties every year and ship them worldwide direct to your front door. 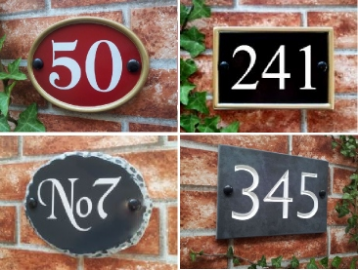 All house numbers, name plates & address markers shown on this website are made exclusively by us at our Yoursigns Ltd workshops in Sandown on the Isle of Wight, UK. 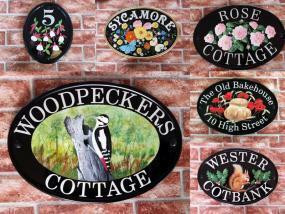 Please take a look at our ranges - you won't find them on sale by any other online sign company. 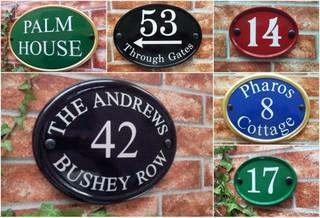 Find your ideal House Sign by viewing Catagories or view our Full Collection all at once! 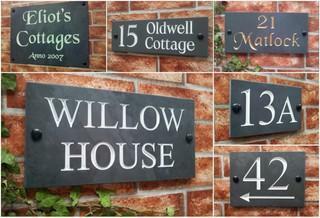 We only use traditional deep V-carve engraving methods in the production of our solid slate range. 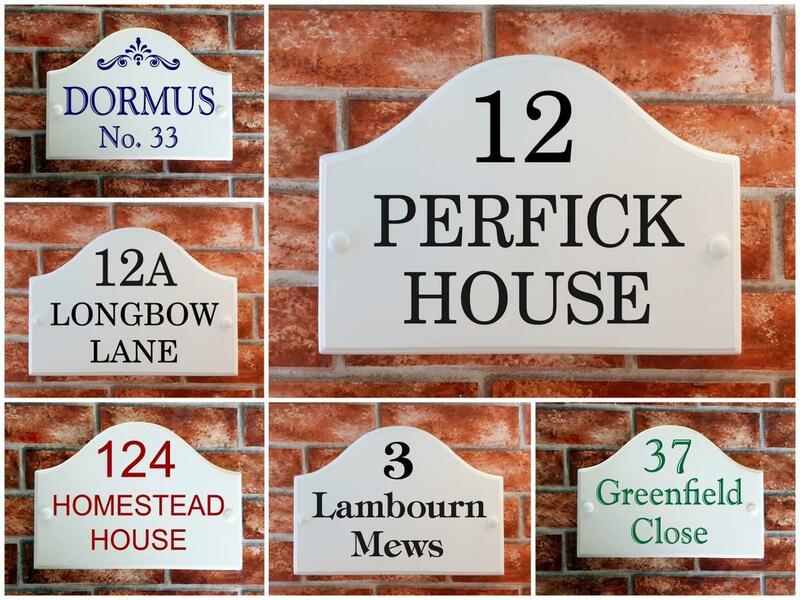 We consider this method to be the ultimate engraving method giving beautifully shaped house names and house numbers with a choice of inlay colours. Also available in bespoke sizes. 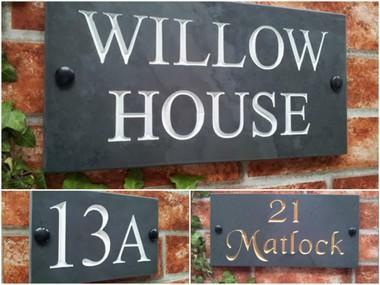 Please be aware - most 'engraved' slate signs offered online are either shallow laser marked or sandblasted - not V-Grooved like ours. 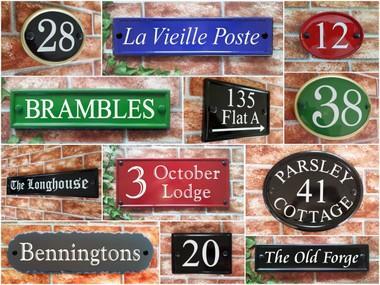 This large & varied range is available in rectangular, oval and bridge top shapes and in a choice of black, blue, green or burgundy/red background colours. Ideal in badly lit locations the house numbers and lettering will shine up from a distance at night if a light is pointed at them. 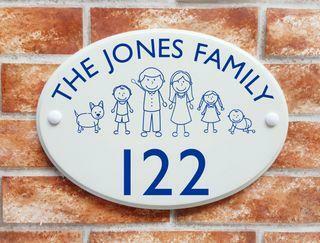 We can also offer Hand Painted Pictorials on a selection of our larger reflective house plaques. 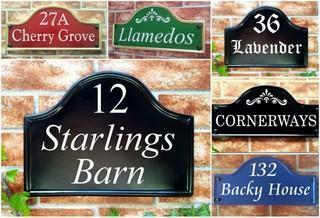 Our range features deep v-grooved numbers and house names in a choice of 7 different paint colour inlays. They are made from a solid surface material similar to Corian which is tough and durable outdoors and will never need painting. They are so tough we gaurantee them in any climate for 10 years! 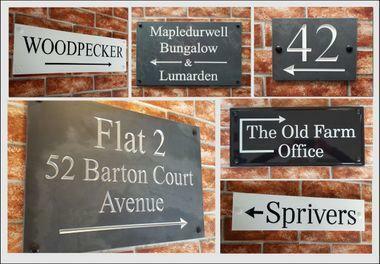 For difficult to find homes we offer house signs with various directional arrows to point first time visitors in the right direction to the property. 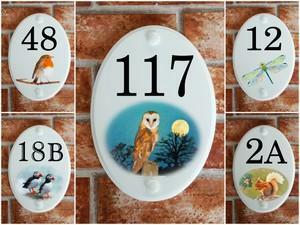 Available on ALL products we make except on our smallest 100mm by 100mm single digit engraved house numbers. Our ceramic style range is not made of pottery. They are made from cultured marble which is completely waterproof and weather resistant and will not craze or crack like some ceramic house plaques can. 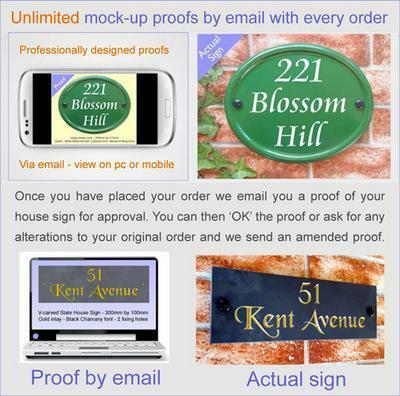 The images are created by our own sign artists and digitally scanned for printing on our UV resin ink printer - the latest high resolution, weather resistant printing method for outdoor signage. We offer a large selection of high quality artistic prints such as dog breeds, cats, flowers, fruit, hobbies etc to personalize your home. 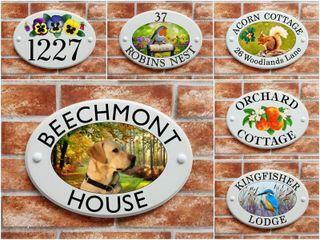 No need for you to spend hours online designing your own house sign - we do it for you! When you place your order our expert designers get to work and create an initial scaled mock-up proof of your order and send you an email link to view it. 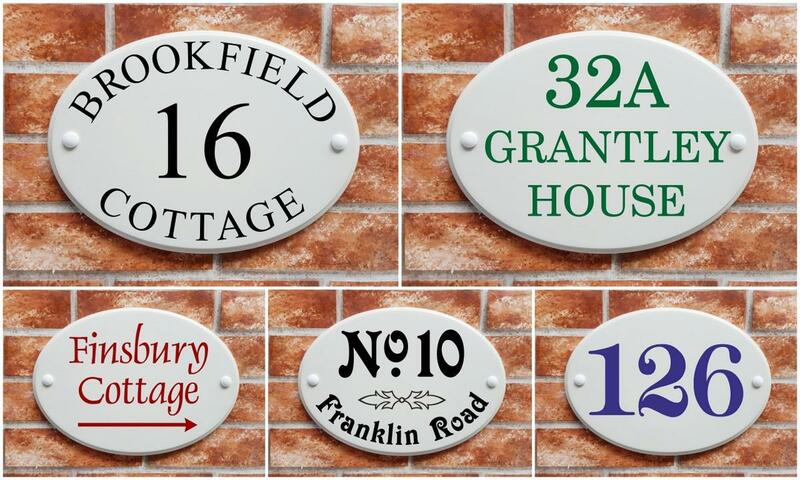 You can either approve the proof or ask for any alterations including change of font, colour, actual text or even size and shape of house plaque. 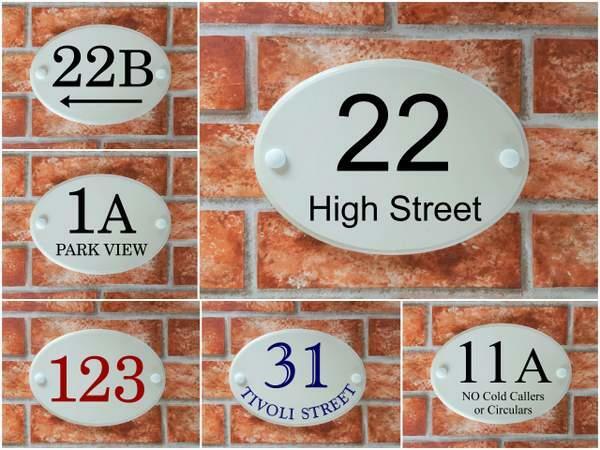 This way you can see exactly the style of the house name or number plate we are going to make for you and you are not committed with the limitations of an online designer tool. Over the years the vast majority of customers give us 5 Star reviews. 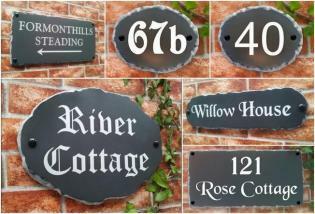 We love to hear from customers after they have received their signs via the reviews feature on this site. Reading these comments makes us proud of our company, products, staff and customer service. To read the reviews simply click on the reviews tab on each individual product page - you can also leave your own review there once you receive your own sign. "I received the house sign yesterday. On opening the packaging I was pleased at the first class quality for the price I paid. The sign looks much better than the proof. 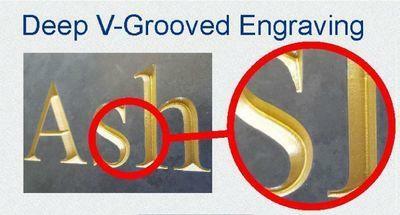 The 'V' shaped engraving looks really smart and shows our house name superbly. 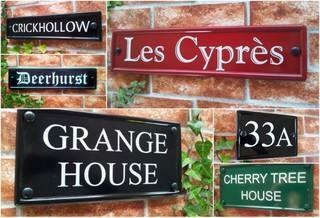 Thank you to all the team a Yoursigns, I will certainly recommend you to my friends and family. Many thanks, "
"We have received our two signs ( not installed yet) and we just wanted to thank you for your Beautiful job. We are very happy with the result, thank you very much. Best regards "